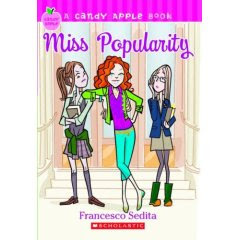 This was the third Candy Apple Book (all the books are about different characters, so it doesn't matter which one you read first). The main girl was into clothes and fashion, but it didn't have the boy/girl relationship stuff that the other Candy Apple Books have all had. It was more about the importance of being yourself even when you are the new kid. Other than that, it was pretty comparable to all the other Candy Apple books. Cassie Knight was the most popular girl in her Texan middle school. She was nice, outgoing, and extremely fas hionable. But when her father got transferred to Maine, she became the school outcast. Everyone at her new school was prim, proper, and only wore gray. In an attempt to fit in, Cassie decided to take charge of the annual school fund-raiser. Can Cassie pull the fund-raiser off, and convince the kids in her school that being different isn't always a bad thing? Kudos for having a blog solely devoted to clean reads! I am a bookseller (and book reviewer/blogger) who loves scouting out, reading, and posting about clean reads, to help my younger readers (and concerned parents or teachers) find appropriate stories!